Until I became First-in-Charge-of-Laundry-Operations (a position that comes with being a parent), I never understood my own mum’s heavy sighs to discover wet bathers and towels left at the bottom of my school bag. Discouraging, stinky, damp and invariably found after the washing had already been done, it was a constant frustration. Use a swim bag though and the task of the First-in-Charge-of-Laundry-Operations is that much easier. The designers at Mooo have introduced their own brand of personalised cute to the pool just in time for summer swim sessions. Perfectly sized swim bags complete with zippered pockets, water resistant inner finish and an adjustable shoulder strap keeps clothes dry (and then contains the soggy bits after swimming is over!). 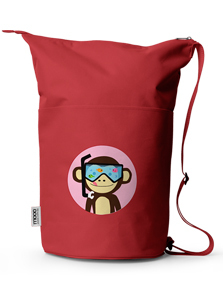 And because the team at Mooo like to make sure you know whose is whose, the bags are available in three different colours and a huge range of personalised designs – I can’t resist their scuba monkey design but the gingerbread man in a surf-lifesaving suit seems appropriate for an Aussie summer. Order now at Mooo for delivery in time for Christmas. Swim bags are $49.95 each.